By now most people must have heard the unpleasant news that Walter Lewin, the beloved and world-renowned physics teacher at MIT whose legendary video lectures drew comparison with the Feynman Lectures on Physics has been barred from campus and stripped of his emeritus professor title in response to charges of sexual harassment of a student in one of his MITx courses. Unfortunately, considering the very public fame that Lewin achieved, MIT has been frustratingly silent on divulging the details of the events, but we can only assume that the charges were quite serious and supported by strong evidence. It's a very painful and precipitous fall from grace for someone who had achieved the kind of stardom reserved for a handful of science personalities - images of Lewin swinging from a pendulum to demonstrate how its period is independent of its mass, or risking being struck in the face and badly hurt by having the pendulum approach his face within a hairsbreadth are now part of science folklore. As someone who has savored many of his lectures as well as his book, I am not the only one to feel pained, confused and stunned. What I find bizarre is that MIT has chosen to take down all the lectures that made him famous. I simply don't understand this, especially since they have quoted reasons of "safety" in doing this - how could Lewin possibly entice or harass students simply through explaining the motion of a simple pendulum through an old, archived lecture? Apply whatever punishment you see fit to him but why deprive millions of students around the world of the joy of physics? As an institution that pioneered online courses through the Open Courseware modules, it is particularly damning to have MIT engage in this action. Sadly, the purging of Lewin's lectures from the online universe cannot help but bear comparison to the book burning and blacklisting of speech and writing that was so endemic in the Dark and Middle ages. MIT's actions are akin to banning, say, Wagner's operas because he was anti-Semitic, or Peter Debye's equations because there are hints that he was silently permissive at the very least during the rise of the Nazis. Their actions remind me of the movie "The Ten Commandments" in which, after learning that his beloved son is actually the son of a Hebrew slave, the Pharaoh issues an edict to have Moses's name stricken from every monument and parchment in the land so that his very existence can be erased from history. It really shouldn't be so hard to separate men from their actions, and I cannot understand what motive MIT could have had in taking down the lectures. I am assuming that content in the Internet age is not as lost to the chasm of ignorance as content existing in a few select printed volumes four hundreds years ago, but the issue is really about the medium, not about the message. Whatever their motive, the message MIT is sending to the world is not too complimentary - we will put the objectivity of knowledge on the same pedestal as the fallibility of human beings, and if we find evidence for one we will banish the other one too. It's a very troubling precedent in my opinion. I do hope that especially an institution as committed to the spread of knowledge as MIT reconsiders the decision. Update: I am glad to see that prominent MIT computer science professor Scott Aaronson has the same thoughts and in fact believes even more strongly than I that taking down the lectures is a huge mistake. I also agree with him that MIT needs to be much more forthcoming and transparent in revealing the details of the case to a perplexed public. "I’m someone who feels that sexual harassment must never be tolerated, neither here nor anywhere else. But I also feel that, if a public figure is going to be publicly brought down like this (yes, even by a private university), then the detailed findings of the investigation should likewise be made public, regardless of how embarrassing they are. I know others differ, but I think the need of the world to see that justice was done overrides MIT’s internal administrative needs, and even Prof. Lewin’s privacy (the names of any victims could, of course, be kept secret). More importantly, I wish to register that I disagree in the strongest possible terms with MIT’s decision to remove Prof. Lewin’s lectures from OpenCourseWare—thereby forcing the tens of thousands of students around the world who were watching these legendary lectures to hunt for ripped copies on BitTorrent. (Imagine that: physics lectures as prized contraband!) By all means, punish Prof. Lewin as harshly as he deserves, but—as students have been pleading on Reddit, in the MIT Tech comments section, and elsewhere—don’t also punish the countless students of both sexes who continue to benefit from his work. (For godsakes, I’d regard taking down the lectures as a tough call if Prof. Lewin had gone on a murder spree.) Doing this sends the wrong message about MIT’s values, and is a gift to those who like to compare modern American college campuses to the Soviet Union." Fifteen years ago most people would have laughed at you if you told them kinase inhibitors would become such a big deal: the received wisdom at that point was that anything that competed with ATP for one kinase would just indiscriminately hit other kinases. While that is generally true, we have found over the intervening decade that there is a wealth of detail - type II motifs, allosteric binding, relatively straightforward residue selectivity etc. - that can be tweaked to provide selectivity. In one fell swoop Gleevec upended the conventional wisdom. A similar kind of thinking existed for covalent drugs a few years back, and I think that field too is going down the fortuitous road that kinase inhibitors took and defying the naysayers. This year especially has seen a bonanza of activity related to the discovery and fine-tuning of covalent inhibitors. The most striking and unexpected development in the field however has been the finding that one can find reversible covalent inhibitors that engage a protein target long enough to provide useful efficacy: the pessimistic thinking that had prevailed so far was mainly based on the potent off-target effects potentially arising from irreversible inhibitors. That thinking was justified...just as the thinking that kinase inhibitors would be non-selective was justified in 1998. Reversible covalent kinase inhibitors in particular have seen a lot of interest and publications this year, and it's especially gratifying for me as a computational chemist to see that that the field is benefiting from both experimental and computational approaches. Jack Taunton at UCSF (who has started a company to exploit such kinds of inhibitors) has been a leader, but there have been others. 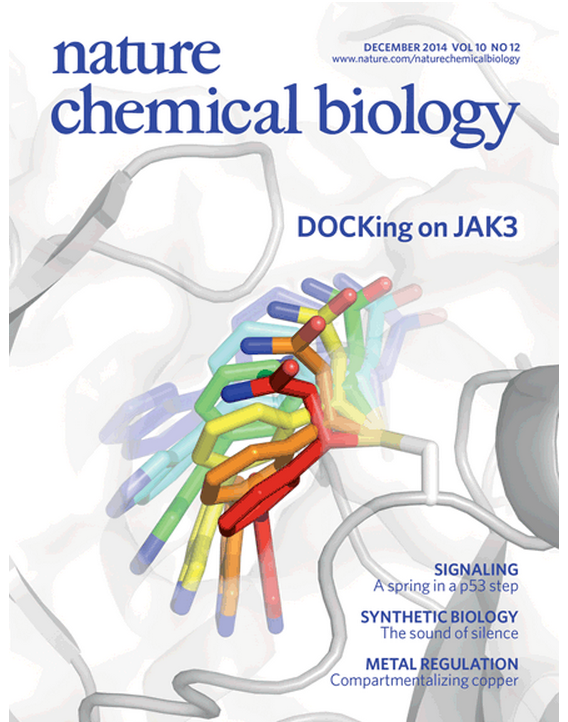 Just recently there was a joint publication from the Taunton and Shoichet groups which used covalent docking techniques to prospectively discover JAK3 inhibitors. Taunton has also done some interesting work with Matt Jacobson from UCSF to use computational methods to tune covalent warhead reactivity - this work would be especially useful in tailoring reversible inhibitors to suit the target. A group at Pfizer did some similar work. Meanwhile the discovery of irreversible inhibitors for other important targets also isn't dead: earlier this year Nathanael Gray's group at Harvard published a report on covalent reversible inhibitors for CDK7, for instance. It remains to be seen - it always remains to be seen - how many of these leads can survive the rigors of the clinic and how general the field becomes. But the approach in general certainly seems to be coming of age, and I will be watching its development with great interest. Quite a bit of promise there and also a real chance to defy some naysayers, which is what scientists especially relish.